I’ve always been afraid of swirling wind. It’s not a reasonable fear, like you might have if you live in tornado country, or in my case growing up, a hurricane belt. I mean any kind of wind you can see in motion: a flapping tarp, tree branches swaying, helium balloons dancing at the end of a curly ribbon leash (for some reason, that’s the worst one). I never say anything, because I know it’s weird and nonsensical, and I’m not going to be the one to ruin the party because holy crap the paper plates are BLOWING AWAY! But when the air stirs, the hair on the back of my neck goes up. I’m serene on the outside, except maybe for fine coating of sweat, while on the inside, my pulse is racing, and I have the bad tingles in the center of my palms. It’s been this way my whole life, but only recently have I come to realize that it’s because this is what anxiety feels like in my body: an elemental, inexorable, chaotic whirlwind that sweeps up all my neatly stacked plans and emotions, flinging them far and wide. My helium balloon mind could snap loose at any moment. There is a calming technique that those of you who are therapy alums like me probably know about. It’s called grounding. You gently reel yourself back into the present moment by tuning in to your senses. What do you see? What do you hear? What do you smell? What are you touching? You ask yourself to notice where you are in time and space. You’re setting a homing beacon, so you can safely return. And this doesn’t only work for Anxiety Blobs like me. You can use it to home in on goodness and gratitude. It’s very easy to get lost in the shitstorm. Visibility may be poor. You may have difficulty navigating. 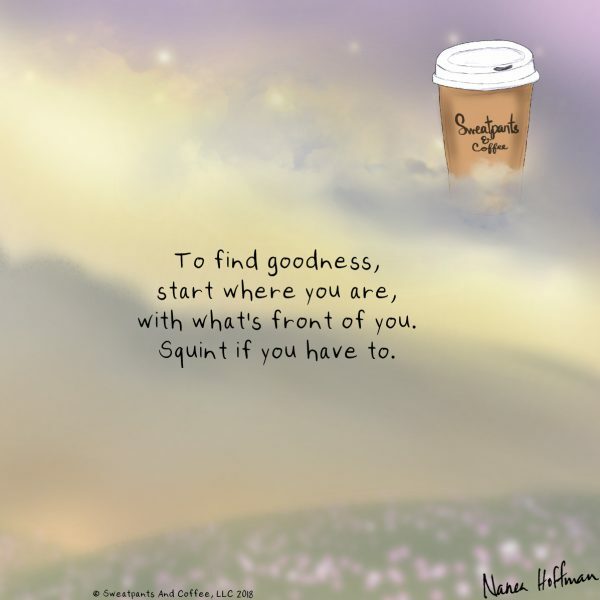 In that case, the best place to start is with what is in front of you. This warm cup of coffee. This messy living room. This thrumming car. This busy office. This cracked sidewalk. This creaky body. Allow yourself to settle for a moment and see what is there. Rub away the streaks on your goggles so that your focus becomes clear. Look for tiny, bright fragments and gather them up. Put them in your pocket and carry them with you. What is in front of you right now, in physical space and/or in your mind? What do you notice about where you are? What beauty is there? List five small good things you can think of right now. Any five, in no particular order. Get full-sized, printable image here.